If Joe Schmidt is serious about getting this Ireland team to a World Cup semifinal [at very least], then one of his principal jobs is to make his team believe they can win every match they play. And I mean EVERY match. Whether it's in Paris, Twickers, Brisbane, Melbourne or Sydney...all venues which lie ahead of us between now and the end of the season. That opening paragraph shows you where my thoughts landed after a tumultuous fortnight up in the rugby portion of my brain. First I had to take all the joy stemming from Leinster's European pool campaign and stuff it into a box until April...it took some doing, although the nature of our quarterfinal opposition helped. Next came the hardest part - taking extra care not to anger the rugby gods by being too confident about Ireland's chances in this year's Six Nations. When you spend as much time as I do keeping up with daily news and views about rugby online, it's quite a challenge to ignore all the talk about Ireland's form in November, our vastly improved squad depth, and the rumblings that annoyed me most of all, the prospect of England v Ireland being a mutual Grand Slam decider on St Patrick's Day. And that was just the talk about the upcoming seven-week test rugby bonanza as a whole...since Monday the subject has turned to our opening match in Paris and the fate-tempting got even worse. Their squad is in disarray. They have all come down with a stomach bug. Their outhalf is about twelve years old. How could the bookies only have us winning by six points after all of that? So I suppose what I have done is fend off the Six Nations thoughts for as long as I can but with the Wolfpuppies in action tonight, I can do so no longer. Time to get my armchair punditry hat on and see what it shoves into my skull. And you know what, when I actually think about it, I'm not half as doomy and gloomy as I thought I'd be. Of course I make no assumptions about our chances. England are going for three titles in a row and will be the team to beat. Wales and Scotland will be equally dangerous for the rest of the tournament no matter who wins their battle tomorrow. France are as unpredictable as ever. Even Italy can't be taken for granted as their coach is well used to big occasions in D4 and he's not afraid to throw the odd tactical curveball. But what I have come to realise about this current Irish set up is this...once we start a match with the right focus, nobody can ever feel comfortable playing us. Would you have it any other way? Speaking of having the right focus, I never thought I'd have to comment on what I call 'The Belfast Crown Court Matter' on my rugby blog but sadly events during the week mean I must - though only in relation to how it affects the Irish squad this weekend. Obviously I have a wider opinion on the situation but it is not one for sharing nor debating on the Harpin On Rugby network. While I agree with the assertion from Irish coaches and players that it is a legal matter which shouldn't be commented on at a rugby press conference, I can hardly blame the media for asking questions that were clearly begged by the actions of two senior members of our matchday squad, one of whom is team captain. Whatever their personal reasons for going to the court that day, I believe it was a bad call at very least from the standpoint of Ireland's need for focus leading up to Saturday. The only selection that raised an eyebrow for me was that of James Ryan. But that's not because I don't believe he's capable and pulling on that 5 jersey in the Stade de France will be an amazing experience for him. I just thought Joe was as settled on Toner as he was other positions and if anything this shows we have even better competition for places than we hoped for. Obviously the key to this match will be Johnny Sexton. He has been in fine form this season, not just in certain situations, but overall tactically. Clearly he is playing a big role in the gameplan and if he can make the gulf of experience between himself and his opposite number tell in the opening stages, it can only mean good things for us. But what if the French take him out? I could put that more diplomatically but come on, we're all thinking it. That is definitely a problem and we'll just have to hope he is protected by his forwards every bit as much as referee Nigel Owens...though it wouldn't hurt his chances of lasting the eighty minutes either if he let his team-mates bear more of the tackling burden. Speaking of tackling, while it's a shame Garry Ringrose didn't make it, the Aki/Henshaw pairing should do just fine. They showed against the Springboks exactly what I mean by starting a match in the right frame of mind, and I have no reason to believe it won't be the same on Saturday evening. In the forwards I'll be looking for a lot of gainline-busting carries...we certainly have an abundance of players who know how to make that look easy. 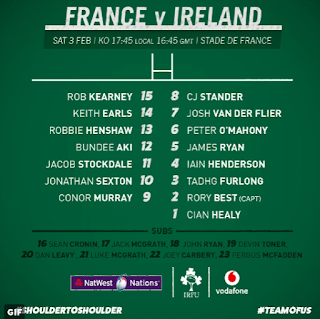 By leaving out Toner we could be putting extra pressure on them to be perfect in the lineouts but the likes of Ryan, Henderson and O'Mahony are well able to take up the slack. When it comes to the bench it's definitely a good selection but having said that, the hope will be strong that when they are introduced they wiil be defending rather than chasing a lead. 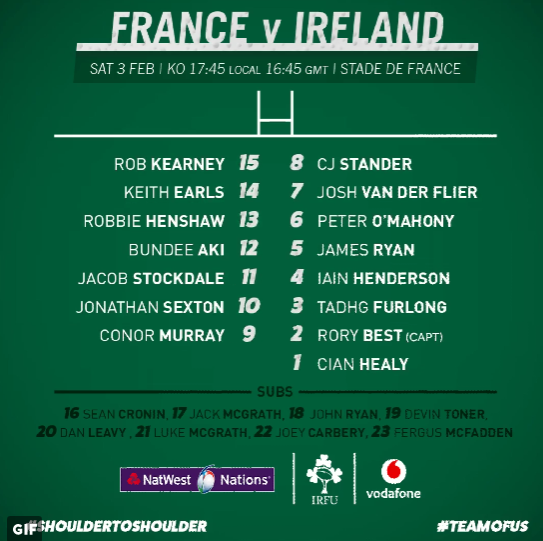 Ireland have to take ownership of the favourites' tag and make it count in the early stages because as we all know the longer the French go into a game knowing they're still in it, the more their confidence grows. Time for the predicting part. Any other year even if I had the guts to forecast an Irish win I'd pray to the rugby gods afterwards for forgiveness. This time, however, I'm going to be as confident as I want the boys in green to be at kickoff time. Ireland by seven is what I say, with the only negative stemming from the match being we could have won by more. PS - as always, best of luck to both the Womens' and Under 20s over the coming weeks also...unfortunately we only have the time and resources to harp mostly on the men for the duration but any team that pulls on that green jersey automatically has our unconditional support. Replacements: 16 Adrien Pelissie, 17 Dany Priso, 18 Cedate Gomes Sa, 19 Paul Gabrillagues, 20 Marco Tauleigne, 21 Antoine Dupont, 22 Anthony Belleau, 23 Benjamin Fall.